Coleman has said the OPVs should have the capability to embark a helicopter. 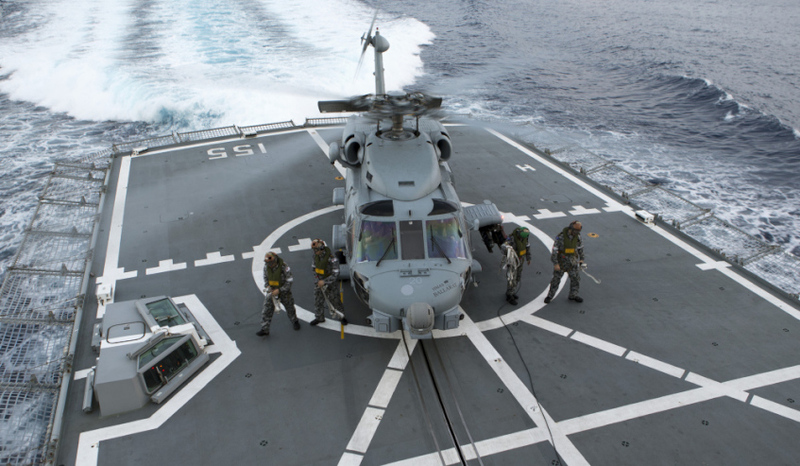 Frigate HMAS Ballarat's embarked Romeo Seahawk helicopter. Image via Commonwealth of Australia, Department of Defence. Any of the bids for the SEA 1180 Offshore Patrol Vessel (OPV) project are capable of delivering the enhanced OPV platform Defence has sought as it moves away from the Armidale Class patrol boats, but Australia is missing a golden opportunity to deliver better equipped vessels, a report has found. Ben Coleman, a former Department of Defence policy analyst and author of the Australian Strategic Policy Institute (ASPI) report, said that while the OPVs are being built to provide border security, maritime security protection and fishery patrols, these requirements are shortsighted as Australia moves into a future strategic environment that will present more challenges in protecting the nation's interests. "These types of maritime security operations, while typical of the past decade or two, don’t represent the whole spectrum of constabulary missions that the OPVs could be tasked to perform over the next two decades," the report says. "Project SEA 1180 seeks to deliver an OPV platform that will be more capable of doing the kind of maritime constabulary tasks that have been performed by the Armidale Class patrol boats ... Defence is well on track to deliver that. "Because strategic policy warns of a more uncertain and challenging strategic environment, there’s a case for a better equipped enhanced OPV force that would be better optimised for more demanding constabulary tasks and would also be a useful supplement to our destroyers and frigates on warlike tasks." Coleman says that by not adding the extra capability to embark a helicopter on the fleet, the mission capability of the future vessels has been diminished. "It appears that Defence hasn’t included a requirement for this [helicopter] system (or a hangar)," the report says. "While a helicopter capability isn’t cheap, its benefit is significant for the maritime constabulary role. Depending on the aircraft, helicopters can carry a much larger payload over a greater range than current maritime UAVs and, unlike UAVs, they can carry personnel for boarding operations, search and rescue, medical evacuation and general transport. These characteristics make helicopters a far superior capability in the maritime constabulary role compared to maritime UAVs. "Even if future UAVs come to narrow the capability gap with helicopters ... large UAVs will still need the kind of deck and hangar space that helicopters require. So the decision not to require the deck and hangar capacity that would enable the OPVs to embark helicopters will also prevent the OPVs from operating larger more capable UAVs, such as the Northrop Grumman Firescout B and C."
The report notes that Damen's bid for the project offers a landing platform that can only carry the weight of UAVs, while Austal/Fassmer's and Lürssen's designs have landing platforms capable of handling helicopters the size and weight of Australia's MH-60 or MRH-90. Coleman also suggests, for the sake of having the future OPV fleet tackle tasks involving a higher level of risk, "there would be also be value in command and control systems that can integrate with other ADF platforms and systems" and weapons to take on situations with more warlike conditions. "The capacity to store and operate special mission equipment (for example, in containers that can be swapped out depending on the mission) would also be valuable," the report said. "In addition, to deal with hostile armed opposition (such as armed coastguard vessels, state-sponsored harassment by fishing vessels, pirates and organised terrorist groups armed with portable weapons, UAVs and simple communications) it would be valuable to have helicopter/UAV weapons (such as rockets and machine-guns), a medium gun (such as 57mm or 76mm calibre) for the OPV, and fast-firing cannon (such as 20-40 mm) and sensors to deal with opposing UAVs and fast small boats." The three international contenders for the project, Damen, Fassmer and Lürssen, and industry are expected to know the result of the tender process in the coming weeks. Both Damen and Lürssen have partnered with ASC and Civmec/Forgacs for the $3 billion project, while Fassmer entered into a joint venture with Austal.